Ultrasound imaging or sonography is a non-invasive medical procedure using high-frequency sound waves to visualize soft tissues such as muscles and internal organs. Ultrasound imaging uses a small transducer (probe) and ultrasound gel placed on the skin to capture in real-time images of organs in the body. It can also show movement such as blood flow through blood vessels. The transducer sends out high frequencies, traveling through the gel into the body, and returning sound waves or echoes are displayed as images on a monitor. The image displayed is based on the return frequency and strength (amplitude) of the sound signal, as well as the time it takes to return from the patient to the transducer. There is no ionizing radiation exposure in an ultrasound. Ultrasound imaging are used to aid physicians evaluate and visualize the heart, blood vessels, pancreas, spleen, liver, kidneys, bladder, thyroid, scrotum, uterus, and more. It may also be used as a guide in procedures such as biopsies to extract samples for laboratory testing. Doppler ultrasounds help to visualize blood flow through vessels and echocardiograms view the heart specifically. Before an exam, patients may be asked to lift or remove certain clothing to expose areas of the body to be visualized. Some ultrasounds involve fasting prior to the exam or drinking water and avoid urinating to fill the bladder. 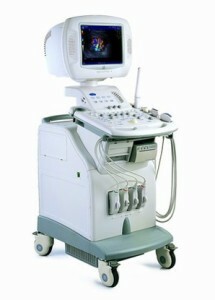 Ultrasound should be painless, although some discomfort may be anticipated. ** Please consult with your physician and/or radiologist for detailed instructions or any concerns regarding on how to prepare for your ultrasound.